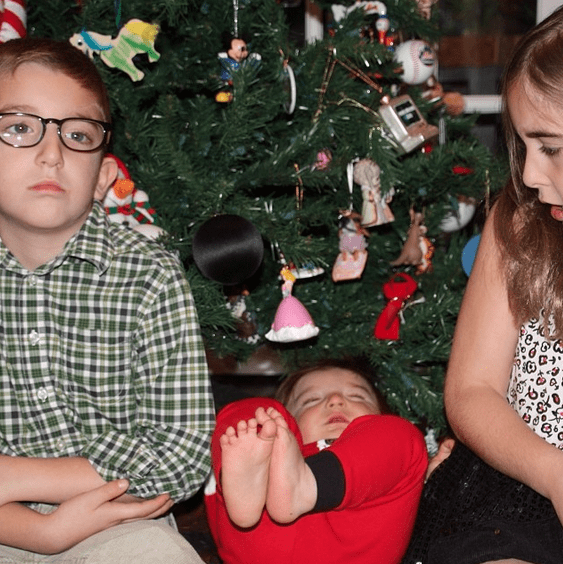 We took our family Christmas card photo this weekend and … it was interesting to say the least. I tried to do it right before Caleb’s nap. WHAT WAS I THINKING? He was SO NOT HAVING IT. Hysterically crying. Liam was pissed because I kept making them both smile while Caleb was crying. But Bill and I kept snapping along because maybe just maybe one shot would work, right. I was focusing on Liam telling him to smile. I wasn’t really looking at Caleb… so I didn’t see that he was falling backwards. Thankfully, he was so close to the tree that he fell into the tree and then softly onto the floor. But you’d think one of my children would do something??? I realized after he was on the ground. I grabbed him and Bill took the camera. He flipped back through the pictures and found this. You can’t make this up folks. Liam is completely uninterested. Natalie looks like she is semi-concerned… but not enough to actually REACT and help Caleb. I mean…talk about an awkward family photo.